Thank you so much for your sweet comments and tweets yesterday about my one-year blog birthday! I'm over the moon that so many of you have entered the surprise giveaway! I have the best readers ever! Thank you! I have been saving these photos just for this post. I love Halloween, and since it's just a couple days away, what better way to kick off the holiday weekend?! 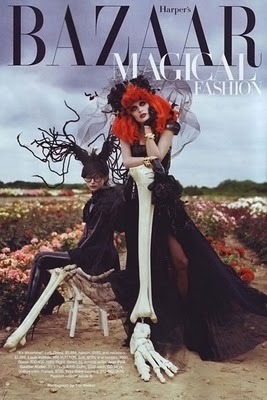 Last year's October issue of Harper's Bazaar was inspired by the magically sinister ideas of Tim Burton. I adore Mr. Burton and his creepy crawly characters, don't you? Here's a little Halloween glam to get your weekend started! I am loving these photos! Perfect for getting you in the Halloween spirit! Don't forget to enter the giveaway, dolls! 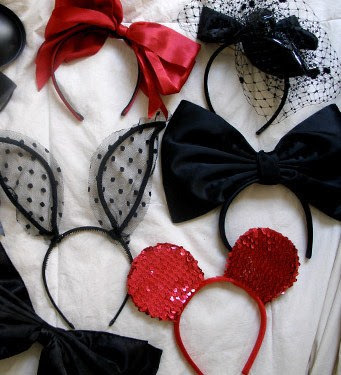 I love those headbands- too cute! Those are perfect halloween glam pictures Julie!! Yes, I love Tim Burton! Hope you have a fabulous weekend! Happy HALLOWEEN!! What absolutely GORGEOUS photos! Breathtaking fo sure :) AND...happy one-year!! I am just now playing catch up, so I'm going backwards. Headed to yesterday's post to see about your giveaway. Mr. Burton is a little cray-cray, but he's also awesome too. Julie Girly Girl, how the heck are ya, he he! Happy One year Anniverary!How wonderful! 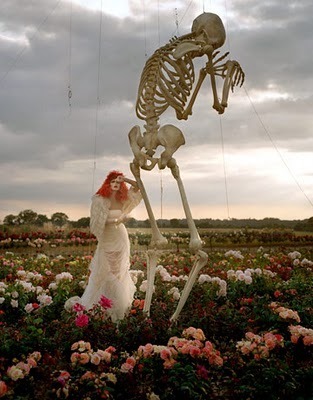 Love this post, very kooky and fun! I hope you have a wonderful Halloween weekend! 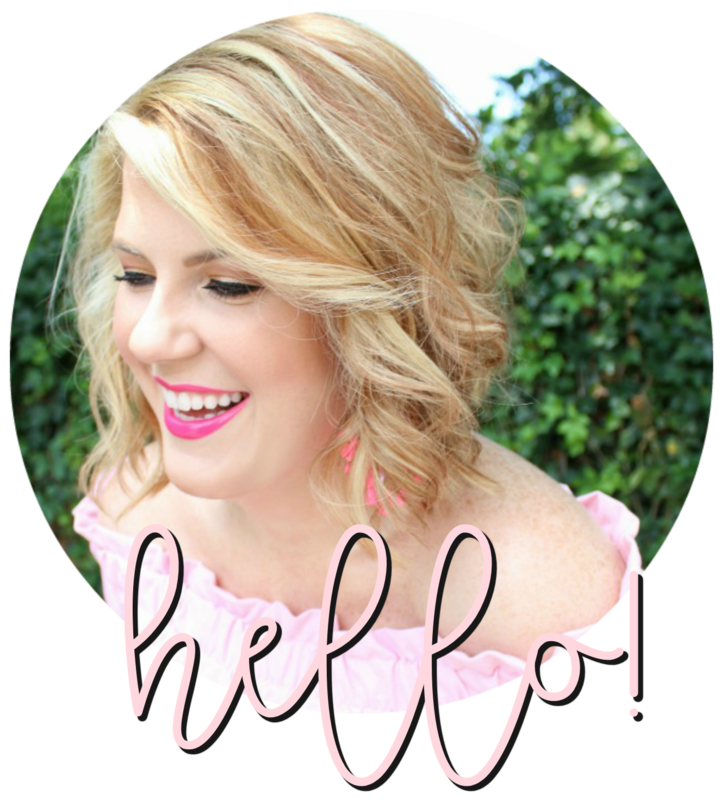 Fun Halloween blog post, and Happy 1st Birthday to you blog too!!! Adore these images, especially those with bursts of ornage/red. Wow! Those are some scary fashion! But the bunny ears are cute. i always wanted to dress as lydia from beetlejuice, just because it's sooo weird. 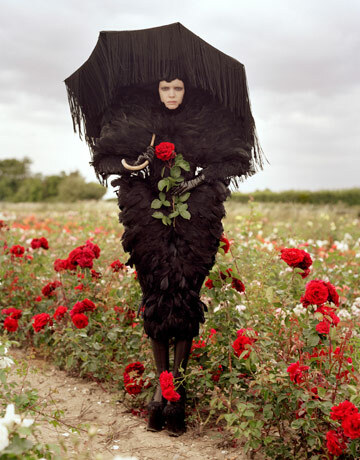 Yes I saw this fantastic shoot as well. It's magnificent and would have been so much fun working on!! I included one of their pictures in my halloween post as well, but love seeing the whole suite here. Hope you had a fabulously spooky weekend!